Hand brewed by beer artisans, Cameron’s newest release Sirius Wheat Ale is our interpretation of the American wheat ale style. This new ale is brewed with Canadian malted wheat, two row malted barley and newest breed specialty hops. “This all-natural, unpasteurized, unfiltered wheat ale has a distinct citrusy aroma and a taste that is quite quaffable,” says Jason Britton, Cameron’s Brewmaster. Light, rounded, thirst quenching, and refreshing; Sirius Wheat Ale is is packaged unfiltered with a proportion of wheat in grist bill, Cameron’s Sirius Wheat Ale has a cloudy appearance with the proteins and yeast in suspension. “Our brewers continue to push the boundaries of innovation in the art and craft of brewing high quality products. Our newest seasonal is already garnering great reviews from our beer connoisseurs. Sirius Wheat Ale is in a way a bit of a departure from our other products, as it is a lighter brew, lower alcohol (4.2%) but without any compromise on the flavor,” says Bill Coleman, president and Co-owner, Cameron’s Brewing Co.
For centuries brewers have been making wheat beer. Back in colonial America, President Thomas Jefferson and his wife Martha were known for their wheat beer. “Our ancestors used wheat for a variety of reasons including the fact that wheat was an ingredient they could grow in abundance, providing good “heading" properties for a very drinkable beer. Those qualities are still very important to beer connoisseurs today,” adds Mr. Britton. 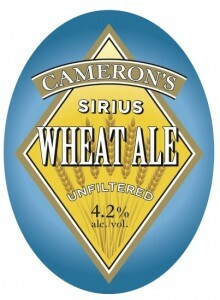 Cameron’s Sirius Wheat Ale is currently available at the Cameron’s Retail Store and select licensees throughout Ontario. Currently we are serving at Betty’s, Compass Restaurant, Griffin Gastropub, BarVolo, Stout Irish Pub, Dangerous Dan's Diner and more every day. Six packs retail for $12.95 and 30 and 58 litre kegs retail for $115 and $212 (plus HST&Deposit).